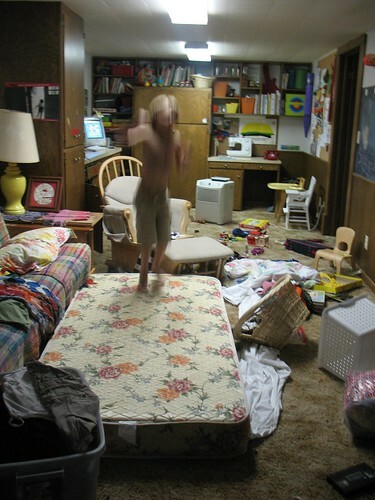 disregard this post’s boasting of a tidy home….look at the basement. “basement”… a term even more odd and fairy-tale like to us than “clean”. mmm…i love honest reality! makes my life feel so much more normal! i’m thinking that “clean” and “organized” is something that i will aim to accomplish in about 20 years! look at my parents – their house is clean and tidy and i know that it wasn’t always that way (obviously no fault of their own except that they didn’t spend the money on a cleaning service!! :P) embrace the chaos as a life-stage that will build your character and hone your skills so that when the time is right and opportunity arises clean and organized will be a breeze!! all over not just the basement.